The Mapuche people's modern political movement began as efforts to maintain autonomy and ownership of their ancestral lands in 19th-century Chile and now faces intense police and political repression, says scholar Cristian Perucci. 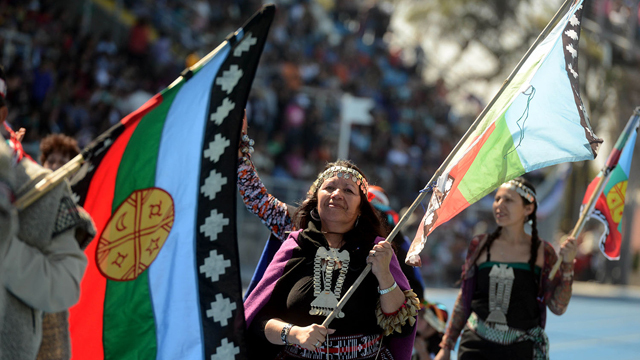 Mapuche participants in the bicentennial celebration of the Battle of Rancagua, Chile. (Photo: Warko via Wikimedia Commons, 2014; cropped. CC BY-SA 2.0. 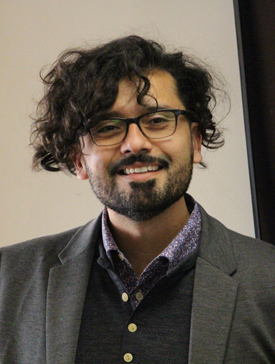 UCLA International Institute, February 22, 2019 — Universidad de la Frontera’s Cristian Perucci, who researches the cultural, economic and political repression of the Mapuche indigenous people in Chile, spoke recently at an event sponsored by the Center for Southern Cone Studies and the UCLA Department of Spanish & Portuguese. The Mapuche people succeeded in a long war against Hispanic conquistadors that began in the 16th century, resulting in a recognition of their territory and government. However, those that had indigenous autonomy were brought under state control in Chile at the end of the 19th century. “Chilean politics and the Mapuche people would thereafter be forever intertwined,” noted Perucci. The Spanish colonial empire went to war with the Mapuche people in the late 1800s. The conflict, said the speaker, revolved around three central themes: jurisdictional autonomy, return of historical territory and cultural identity. “Each country thought that progress was going to occur once they annihilated the Mapuches,” said the scholar. However, this goal was never achieved and the Mapuche adapted by creating political organizations. Perucci described the formation of these organizations as the beginning of the Mapuche indigenous movement. According to Perucci, two major historical periods are significant for the Mapuche in Chile: 1861–1863, which marked the beginning of the occupation of Mapuche lands by the Chilean state, and the 1970s, which marked the start of counter-agrarian reform in the country. During both periods, Chile divided indigenous lands and gave land concessions to foreign and domestic settlers. “Land recovery, thus, became the main goal for Mapuche leaders who hoped to achieve this through various political actions, including revolts,” said the speaker. In the late 20th century, the movement developed its own sense of nationalism. “Mapuche nationalism is a reconceptualization of history and tradition and was pushed forward by Mapuche intellectuals in the 1990s,” observed Perucci. Items that symbolized Mapuche nationalism included a flag adopted by the entire Mapuche community; the Mapuche language (which was recovered in communities that once converted to Spanish); territory, today conceived as Wallmapu; and traditional authorities, such as Mapuche chiefs, shamans and spokespeople. The nationalist moment that began in the 1990s was criticized for its anti-capitalist ideas and occasional violence, said the speaker. “A few Mapuche groups have incorporated violence, specifically arson, as a means of political action in order to gain political achievement,” said Perucci. The first of these episodes occurred in 1997, when three trucks belonging to a Chilean settler were torched. Judicial and police repression of the Mapuche people began in the late 1990s, noted the speaker, when they were first labeled "terrorists" by the Chilean media. “Since 2002, there has been a special law applied abusively and excessively to the Mapuche called the anti-terrorist law,” he added, “which was created and used to dismantle the political opposition against Pinochet’s dictatorship and today is used to undermine the Mapuche.” The law specifically permits judges to keep Mapuche individuals in jail longer than the three-month limit established for other Chilean citizens. In the mid 19th century, Chile and Argentina — among other countries — believed that their civilizations would be impure and decay if indigenous people such as the Mapuche were not removed from their territories. After attempts to banish them through land dispossession and theft, the Mapuche people understood that only land recovery could establish their presence on a permanent basis. Not only is there is no resolution of the Mapuche drive for more rights and autonomy in sight, said Perucci, but great prejudice against them remains in Chilean society. “The issue of land rights and repression… must be solved if we want to go forward with a Chilean-Mapuche relationship,” Perucci concluded.